Ever wonder why scientists love science? We asked. Happy Valentine’s Day. We often think of damage on a surface level. But for plants, much of the important response to an insect bite takes place out of sight. Over minutes and hours, particular plant genes are turned on and off to fight back, translating into changes in its defenses. 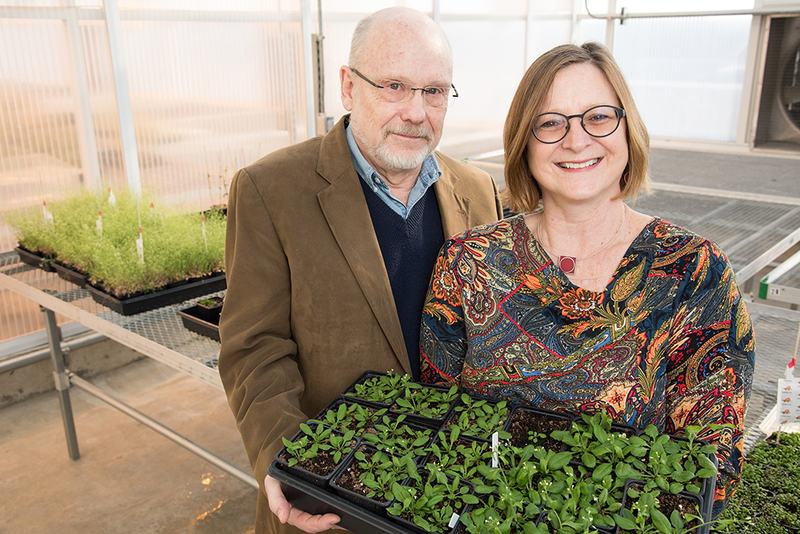 In one of the broadest studies of its kind, scientists at the University of Missouri Bond Life Sciences Center recently looked at all plant genes and their response to the enemy. Their results showed that the model Arabidopsis plant recognizes and responds differently to four insect species. The insects cause changes on a transcriptional level, triggering proteins that switch on and off plant genes to help defend against more attacks. 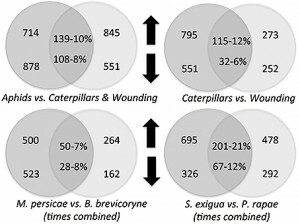 Plants fed on by caterpillars – cabbage butterfly and beet armyworms – shared less than a quarter of their changes in gene expression. Likewise, plants fed on by the two species of aphids shared less than 10 percent of their changes in gene expression. The plant responses to caterpillars were also very different than the plant response to mechanical wounding, sharing only about 10 percent of their gene expression changes. The overlap in plant gene responses between caterpillar and aphid treatments was also only 10 percent. A sister study explored this phenomena further, led by former MU doctoral student Erin Rehrig. It showed feeding of both caterpillars increased jasmonate and ethylene – well-known plant hormones that mediate defense responses. However, plants responded quicker and more strongly when fed on by the beet armyworm than by the cabbage butterfly caterpillar in most cases, indicating again that the plant can tell the two caterpillars apart. The result is that the plant turns defense genes on earlier for beet armyworm. In ecological terms, a quick defense response means the caterpillar won’t hang around very long and will move on to a different meal source. A study this large has potential to open up a world of questions begging for answers. Frontiers in Plant Science published the primary study in its November 2014 issue. The sister study can be read here. It’s an understatement to say viruses are small. But an average virus dwarfs the diminutive variety known as parvoviruses, which are among the most minuscule pathogens known to science. 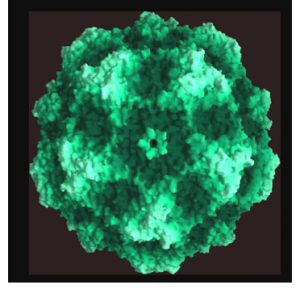 Tucked inside a protective protein shell, or capsid, parvoviruses contain a single DNA strand of about 5,000 nucleotides. If parvo’s genetic material is like an hour-long stroll around your neighborhood, a bigger virus like herpes is equivalent to walking from St. Louis to Columbia, Missouri. Dr. David Pintel stands next to a scan in his lab in Bond Life Sciences Center on Tuesday, Feb. 3, 2015. Hannah Baldwin/Bond LSC. But that little stretch of DNA still has plenty of tricks up its sleeve. Pintel has spent nearly 35 years studying parvo and is one of the world’s foremost experts on the virus, but he’s still plumbing the tiny pathogen’s depths. 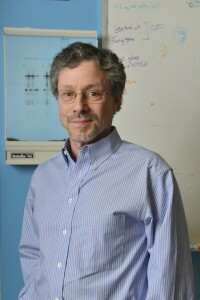 His lab focuses on unraveling how parvo interferes with a host cell’s lifecycle and understanding the virus’ quirky RNA processing strategies. Over the last two decades, parvo has become an important tool for gene therapy, an experimental technique that fights a disease by inactivating or replacing the genes that cause it. Researchers enlist a kind of parvovirus known as adeno-associated virus as a gene therapy vector, the vehicle that delivers a new gene to a cell’s nucleus. Pintel helped suss out the virus’ basic biology, an important step for developing effective gene therapy. The name ‘parvo’ comes from the Latin word for ‘small.’ But the virus’ size makes it a resourceful, versatile enemy and a valuable model for understanding viruses and how they interact with hosts. Parvoviruses fall into five main groups. They infect a broad swath of animal species from mammals such as humans and mice to invertebrates such as insects, crabs and shrimp. Canine Parvovirus at 2.9 A (Tsao, et al, Science. 1991; 251:1456-65.) Courtesy David Pintel. Canine parvovirus, or CPV, is perhaps the best-known type. It targets the rapidly dividing cells in a dog’s gastrointestinal tract and causes lethargy, vomiting, extreme diarrhea and sometimes death. In humans, Fifth disease, caused by parvovirus B19, is the most common. This relatively innocuous virus usually infects children and causes cold-like symptoms followed by a “slapped cheek” rash. There is no vaccine for Fifth disease, but infections typically resolve without intervention. Pintel surveyed the whole parvo family to understand its idiosyncrasies. To study bocavirus – a kind of parvo recently linked to a human disease – Pintel looked closely at the dog version, minute virus of canines (MVC). 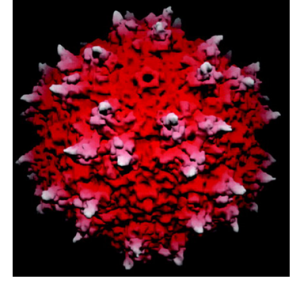 MCV serves as a good model for the human disease-causing virus. While examining MVC, he noticed an unexpected signal in the center of the viral genome. The signal terminates RNA encoding proteins for the virus’ shell, a vital part of the pathogen. Finding such a misplaced signal in the middle of a stretch of RNA is like coming across a paragraph break in the middle of a sentence. 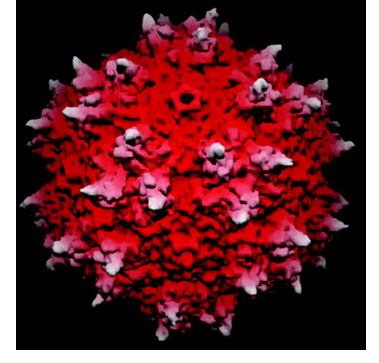 Pintel knew the virus bypassed this stop sign somehow, because the blueprint for the viral capsid lies further down the genome. To overcome this stop sign, this particular parvovirus makes a protein found in no other virus. The protein performs double-duty for the virus: It suppresses the internal termination signal and splices together two introns, or segments of RNA that do not directly code information but whose removal is necessary for protein production. Splicing the introns together ensures that the gene responsible for producing the viral capsid is interpreted correctly. The conflict between a virus and a host is a constantly escalating battle of assault and deception. Viruses need a host cell’s infrastructure to replicate, but have to fool or outmaneuver its defenses. Pintel discovered one example of this trickery in mice, where parvo triggers a cellular onslaught known as the DNA damage response, or DDR. This type of parvo co-opts that defense. Normally DDR pauses the cell cycle to keep damaged DNA from being passed on to the next generation of cells, but parvo exploits that delay, buying time for the virus to multiply. Parvo’s small size makes it especially beholden to their hosts. But that can make them particularly revelatory for researchers. Parvovirus samples from an experiment labeled by Femi Fasina, a postdoc in Pintel’s lab. Caleb O’Brien/Bond LSC. Uncovering such nuanced interactions is a painstaking, laborious process that often goes unheralded by mass media. 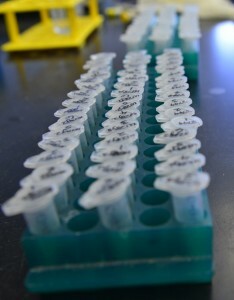 But those fundamental discoveries provide the building blocks upon which other researchers depend, said Femi Fasina, a postdoc in Pintel’s lab. Despite his deepening understanding of how parvo works, there remains one debate about the virus that Pintel deems beyond the scope of his research: Are the tiny slivers of DNA that comprise parvoviruses even alive? Faculty and students crowded the hallways at Bond Life Sciences Center for an interdisciplinary poster session on Saturday. About 40 prospective graduate students listened to faculty and current graduate students from the biochemistry, interdisciplinary plant group, plant sciences, molecular pathogenesis and therapeutics (MPT), genetics area program and the life sciences fellowship program discuss their work. The poster session was part of the 2015 Graduate Life Sciences Joint Recruitment Weekend, an event aimed at helping prospective graduate students determine if MU is the right place for them to continue their education. About 175 people participated, including current graduate students and faculty. MU biochemistry senior Flore N’guessan said she applied to the MPT program because of her interest in virology. “I’ve always wanted to do research,” she said. N’guessan is currently a researcher in the Burke lab, which works on testing potential antiviral therapeutics on HIV. N’guessan has applied to other graduate programs but said that the interdisciplinary and collaborative nature of MU’s life sciences program appeals to her because it allows her to gain skills from other labs. Interested in Bond LSC? Follow us on Twitter, Instagram and Facebook.